This is for a good bloggy friend 😉 As you might have noticed, I LOVE having tons of pictures on my blog. I like to keep my pictures balanced with my text…so the text never seems too lengthy and there are plenty of visuals. Must be the ELL teacher in me! Sometimes older is better. In the case of Blogger pictures, I like the “Old Editor” version. It is easier for me to type my text next to my pictures (more about that further down…). To get to the old editor, head into your Settings tab (as shown above). Towards the bottom of the page you will see “Select post editor”. Here, you will be able to select the Old editor. The newer editor, although recommended, doesn’t let you type your text directly next to the picture (which I like to do!). So (and I know this may sound neurotic, but I am what I am!) I do have a pattern for my pictures. When I post my first picture, I always start on the left. You can do this by selecting the “Left” option on the image screen. 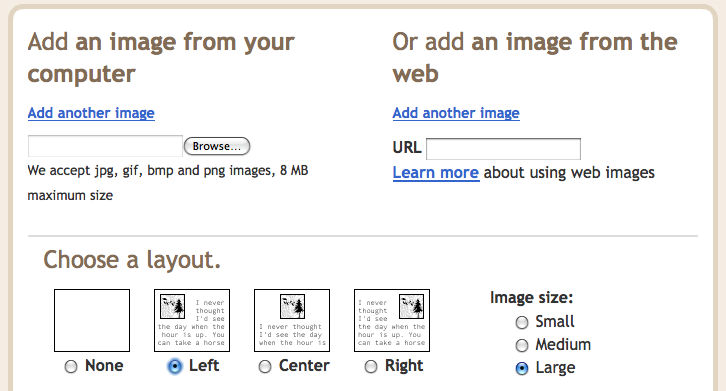 Side note: Once you place a picture or photo (to the left or right) you will be able to type right next to the picture! Just click to the side of your picture, near the top of the image, and start typing. I generally try to make my text about the length of the picture. Then, to place my next picture, I choose “right”…I like how it balances out on the whole post visually! Another neat thing about this old image editor is that you have more control over resizing the image. 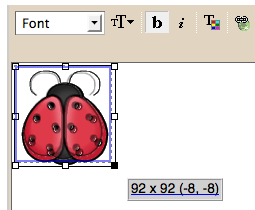 By default, I use “Large” for image size…since I can just click on the image and resize it with the grab points. Note: For some reason, each time you add a new picture, it automatically gets placed at the beginning of your post. Not a problem though. All you have to do is select the picture and cut it. Then, go to the part of the post you would like to place the picture, click at the front of the text (just to the left of the first word in that text area) and paste it. It will automatically align on the side you originally placed it. Want to see what people are pinning from your blog? Goodbye book bags…hello reading drawers! It helps me! I will try that next time I post! Thanks for the tip! You are helping me be a better blogger. I am off to reread how to embed google docs because it keeps freezing on me when I choose the older version(and then I have to revert to the old way of taking screen shots)! GRRR! Keep those tips coming! I know everyone appreciates it and learns so much from you! no wonder I always had such a hard time with this!!! thank ya, thank ya! I want to sincerely thank you for offering such a wonderful website. Last night I was able to find answers on how to insert a Google Docs preview and add a link in comments that I leave on other blogs. I've searched all over the place…but, your site is organized, concise, and very informative. You are very talented. I do have one question that I still haven't found an answer to…maybe you can point me in the right direction. How can I make a picture link using a Google doc? I will post about the picture links next! Also, when I click on my inserted image in a post, I'm not noticing the grab points as you mentioned. I did revert to the older version. I tried right clicking…but still not seeing this option. I don't know…I just use the regular button, not the right click and I can resize the photo. What happens when you click on your photo? When I click on my picture that I inserted as large, nothing happens. I just see a little white hand. Double click doesn't do anything either. Mrs. Lachridge is correct, your site is amazing and organized. Your organization and experience with ELL students really shows with your use of visuals. So… Your next post in the series will have to be creating images like those in your instructions. You are amazing! Thank you for making a technical world make more sense by using such easy to follow directions and pictures! I can't tell you how many times I refer back to your posts to help me out! I so appreciate your willingness to share! Thank you so much!!! Can you believe I was dragging my pictures to their spots???? I knew there was a better way!!! !